« Why is it so hard to do new stuff? 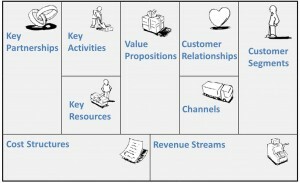 I am a big fan of the Business Model Canvas as a tool to get people to think about their business models and play around with ideas. It’s fun, it’s accessible and it generates lots of questions and discussions. I use it a lot. I ran a workshop the other day to introduce it to some freelance colleagues (fellow members of Kindred HQ) and was asked if there was ‘an order to do it in’. I replied ‘No’ and explained how you can start at any point on the canvas, as long as you put something in all the boxes. 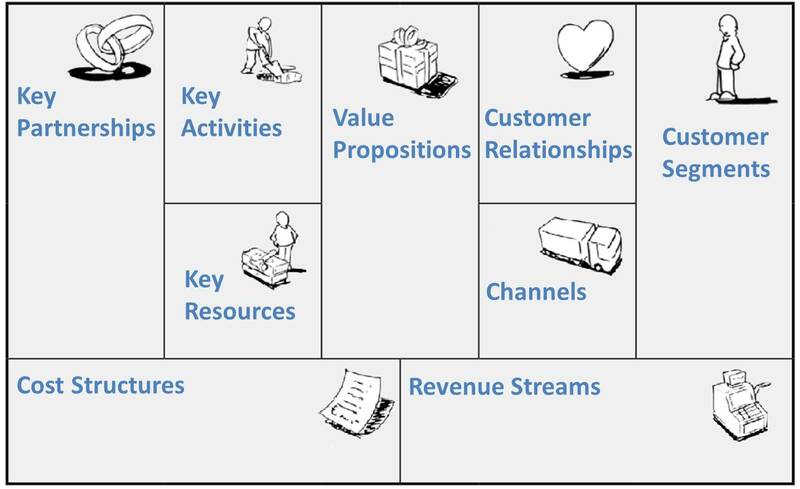 Interestingly enough, they all started on the right hand side, mostly with the Value Proposition and Customer Segment boxes. These two form a key part of the canvas, the Product-Market fit. This wasn’t so surprising as they all have backgrounds in marketing is some form, so a focus on the customer is natural. I also told them that I was lucky enough to go to a talk by Alex Osterwalder, a key architect of the canvas. At the talk he had got us to get into pairs and do 3 canvases in 6 minutes. Yes, really! He said we had a bike, £1000 and were based in London, and we had to come up with 3 different business models. Much to our surprise, we did, as did most of the other pairs in the room. It was great fun, and made me realise how you could really use the canvas in different ways. I had never started from the left-hand side of the canvas before. I have the same marketing bias as my colleagues, I guess. Only perhaps that’s not the only reason. A study of how entrepreneurs think by Dr Saras Sarasvathy (summarised in this INC.com magazine article) showed that they use effectual thinking*, as opposed to the causal thinking prevalent in corporations and large organisations. What’s the difference? 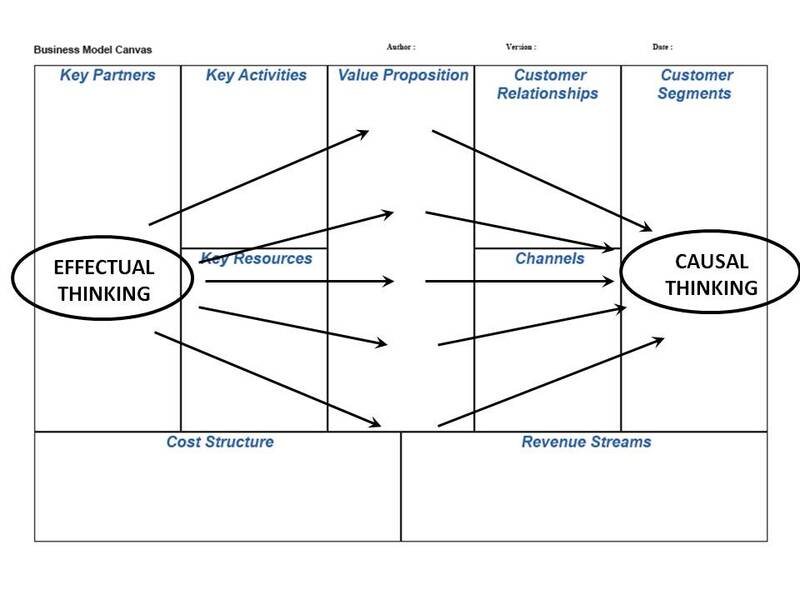 In causal thinking, you determine an objective and then figure out the various options for reaching it. For example, identifying different ways you can deliver a specific project output. Effectual thinking works the other way. It starts with an assessment of the resources available and then figuring out the different things you could do with them. So, rather than narrowing in, you are spreading out. In essence, entrepreneurs ask three questions. What resources do I have? What relationships can I leverage? What can I afford to lose? From there, they then generate a range of possibilities and start by pursuing the one that they feel is most likely to succeed. It strikes me that starting your canvas on the left hand side, with your key partnerships, activities and resources, is using effectual thinking and will create a wide range of possibilities. Whereas as starting on the right hand side, and particularly when you focus on a customer segment, is an example of causal thinking. It increases the focus but reduces the range of possibilities. Maybe it wasn’t our marketing focus but our conditioning, from working in and for corporates and in using causal thinking, that caused us to start on the right hand side. Which is best? Working from the left encourages effectual thinking and will create a lot more possibilities, so that’s better at the initiation stage of a business idea. However, as the idea gets more developed, we then need to focus more on the customer and achieve that all-important product-market fit. So at that stage it’s better to focus on the right hand side and use more causal thinking. As ever, timing, is everything. It’s important to be aware of and master both ways of thinking and move between the two as the situation demands. For example, if you are not growing as you wish and you need to pivot, then switching out of causal thinking and back to effectual thinking is going to pay dividends for you. For both, the canvas remains a great tool for exploring, exposing and testing your ideas. *Thanks for Salim Virani @saintsal. His comments at a Lean Startup London event brought my attention to effectual thinking and inspired this blog. 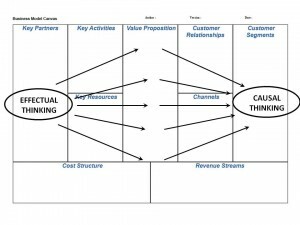 This entry was posted in Uncategorized and tagged Business Model, Business Model Canvas, Effectual thinking, Entrepreneur, Lean Startup, Startups. Bookmark the permalink. Post a comment or leave a trackback: Trackback URL.